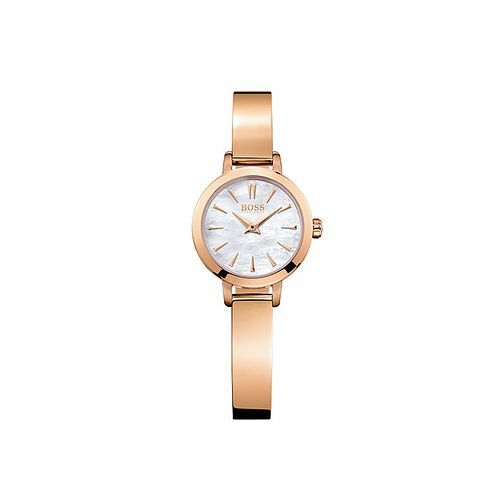 Designed with the contemporary stylish woman in mind, fashion house Hugo Boss presents this beautiful Hugo Boss Ladies' Rose Gold Mother of Pearl Bracelet Watch. Skeleton Strap Watch from the Signature collection. Powered by Quartz movement, this watch boasts a bold 26mm rose gold tone case and complementary iridscent mother of pearl dial. The design is finished with a rose gold link bracelet, water resistant up to 30m this watch is the perfect timepiece for the modern woman.